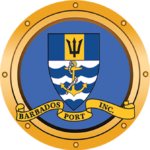 About the Barbados Port Inc. The Port of Bridgetown (officially the Barbados Deep Water Harbour), is a sea Port in Bridgetown on the Southwest Coast of Barbados. Situated at the North-Western end of Carlisle Bay; the Harbour handles all of the country's international bulkship-based trade and commerce. In addition to international-shipping the Deep Water Harbour is the Port of Entry for Southern-Caribbean cruise ships. The Port is one of three designated Ports of entry in Barbados, along with the privately owned Port St.Charles marina and the Grantley Adams International AirPort. The Port handles approximately 700,000 cruise passengers and 900,000 tones of containerized cargo per year. The Barbados Port is at the heart of the country’s productive sector. With tones of goods flowing through the Port daily, service disruption however small could spell disaster for the country’s operation. Over the years due to computerization of critical operations from shipment schedules, container management systems to email communications, the Port is highly dependent on its ability to access its technology resources in a timely manner. With Sunisle, backups took considerably less time to complete compared to their old tape system. Since Sunisle’s incremental-backup approach uploads changes at a block level, it allowed backups to finish quicker than the prior solution. The improved performance of the solution saved time for the staff. What took roughly hours each month doing backup-related administrative tasks, now take minutes and backups happened automatically, with our‘ set it and forget it’ technology. ▪ Ability to make rapid information queries without interrupting the efficiency of rest of the system. ▪ Real-time data replication between the main production platform and data warehouse server. Double Take Zero Downtime Software.